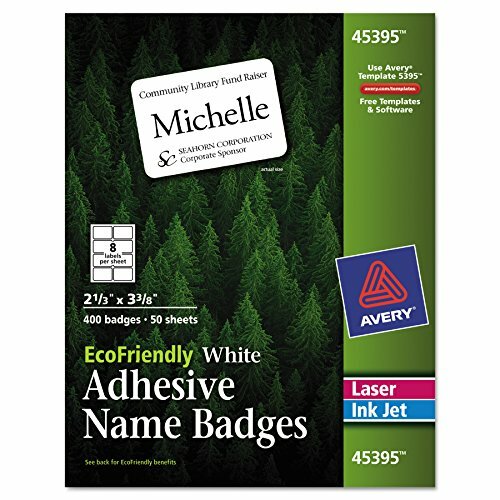 When you're meeting new faces for the first time, be eco-conscious with Avery Name Badges--the labels that work for you and the environment. The label paper and package are produced with 100% recycled material. The label paper and package are Processed Chlorine Free to substantially reduce the harmful substances associated with the manufacturing process. After use, you can continue to help the environment because both the label paper and package are recyclable. The labels and package are also printed with soy- and vegetable-based inks, which come from renewable materials, rather than solvent-based inks. With our Name Badges, you can trust in the same high quality you've come to rely on from Avery products. And with the free Avery Wizard software, you can create and customize your name tags in a snap. 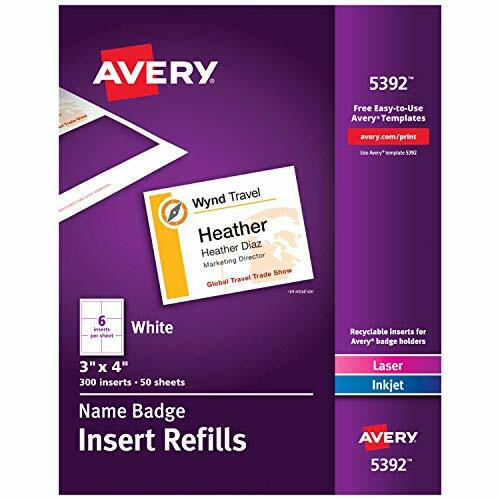 Avery Name Badges help you do your part to leave a smaller footprint. 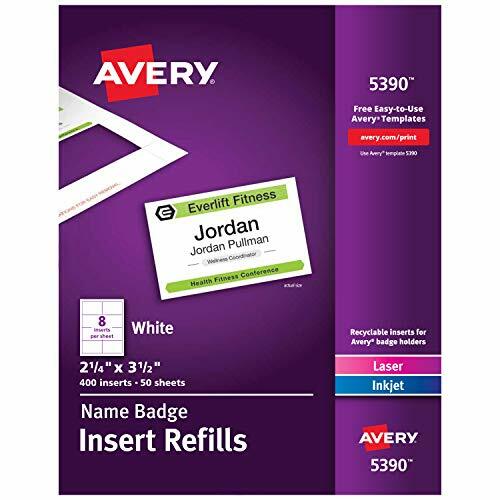 This 5-pack of 1,500 total Avery Printable Name Badge Inserts (Cardstock) is designed to fit Avery Badge Holders #74541, #74459, #74536, #74520, #74540 and #5384. When paired with these name badge holders, you can create durable, professional name tags right from the convenience of your home or office. The name badge inserts feature micro-perforations to separate quickly and cleanly while leaving smooth edges on your name tag. They re superb for meetings, corporate event planning, conventions, networking events, and other professional gatherings, as well class reunions, parties and wedding place cards. Import contact information and personalize your badges with personal titles, company names, logos and more using the free templates and designs at avery.com/templates. 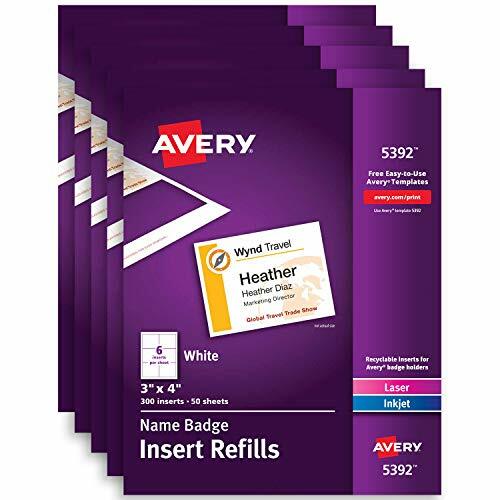 Name badge inserts for Avery Name Badge Holders #74541, #74459, #746536, #74520, #74540, #5384 (not included). Create polished, professional name tags within minutes. Separates cleanly and quickly for a smooth-edged name tag. 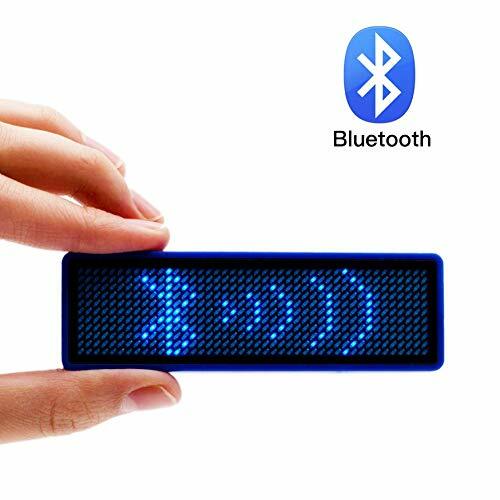 * What is VBLab Bluetooth LED Name Badge? 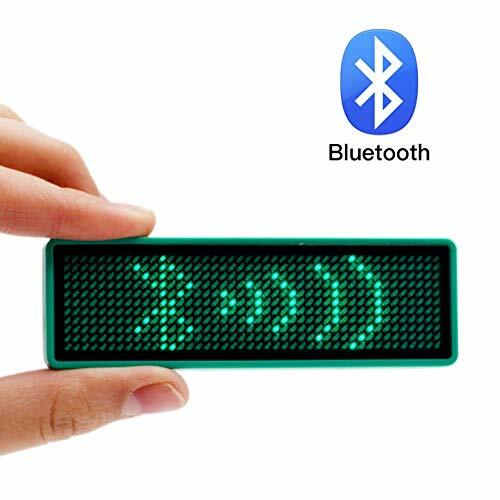 We are the first to enable Bluetooth to LED badge which make it easy to synchronizes with your smartphone application by Bluetooth. 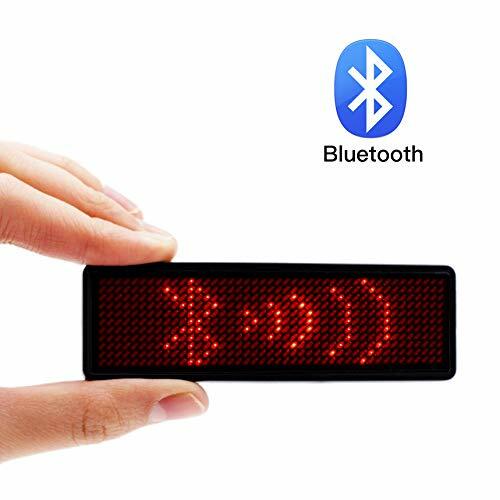 * When can you use VBLab Bluetooth LED Name Badge? -When you wanna stand out and express yourself at concerts, parties, festivals, and etc. -When you wanna maximize your fun with your friends. -When you wanna show your support for artists, sports teams that you wanna cheer on. *How to Setup VBLab Bluetooth LED Name Badge? No worries about setup: Easy to control the led badge by application on you iOS or android devices by bluetooth, don't need to programming on PC. You are the shining star: Attention grabbing no matter at a party, event, convention, reunion or trade show. Light up anything you want: You can create pictures, texts, and animations just several steps. Light up your message and make it stand out simply with the tip of your finger. The power of 24 hour battery life: It lasts about 24 hours on 25% brightness and 12 hours on 100% brightness , takes about half an hour to charge. 1 year warranty: We will change a new one for you if it doesn't work in 1 year. 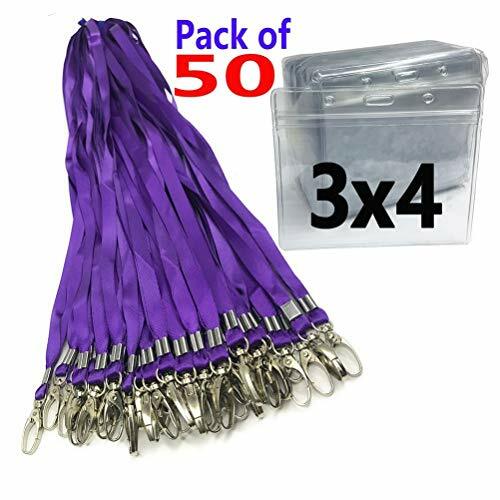 50pack Name tags Badge Holder with lanyard Horizontal Waterproof Plastic Id Card Holder Lanyards Nametags for desks Kids School Camp Field Business Trade Event Name Tag Lanyards Badge Holders. If there's any quality problem, Please feel free to contact Amazon for replacement and/or refund. WITH VALID TRACKING NUMBER. 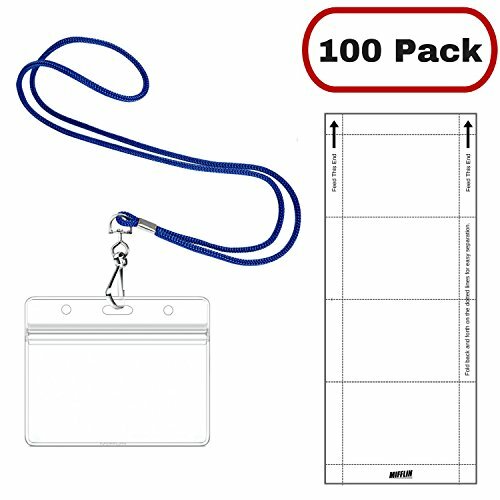 Name Tag Badge Holders with Lanyard - DURABLE, WATERPROOF resealable plastic vinyl pouch is tear-resistant, keeps content safe and secure; braided necklace is light but strong; EASY to UNPACK, EASY to ASSEMBLE: Packed neatly, no more tangled lanyards. Name Badge Holder 3x4 and Lanyard; for meetings, social events, senior centers, reunions business kids school conference desks campfield Business trade event. 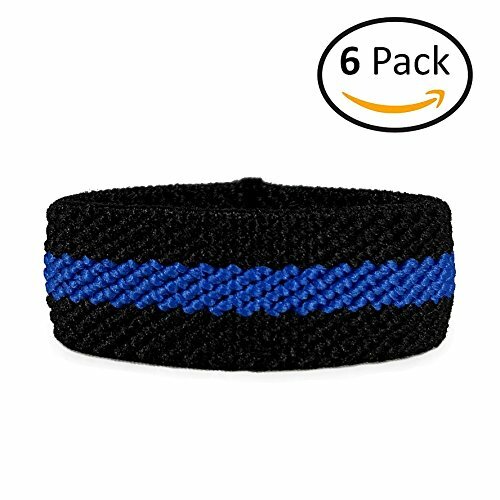 Name Tag Badge Holders with Lanyard - QUALITY & WORKMANSHIP GUARANTEE & 100% BRAND NEW AND HIGH QUALITY;If there's any quality problem, Please feel free to contact Amazon for replacement and/or refund. Make everlasting memories at your next conference, party, or office employee gathering. Let your guests mingle and network, without forgetting each other's names. Use in office settings for employee, VIP, and visitors, or for training sessions, conventions, reunions, parties, mixers, school, scout camps and outdoor activities. 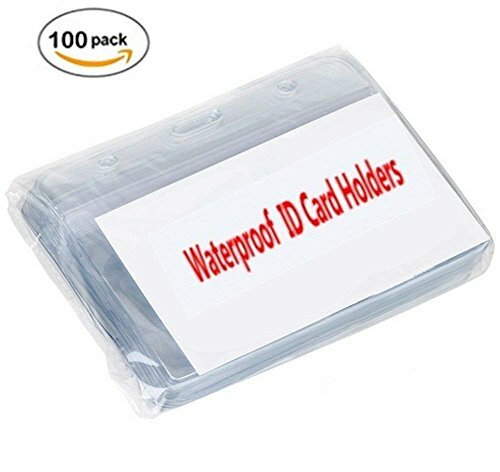 Enjoy a CLEAR display, THICK quality, and WATERPROOF surface with seal-lock to keep contents secure and dry with the lanyard and ID holder combo, which holds any credit card-sized ID or our BONUS BADGE INSERT CARDS . Easy to attach and detach for item easy to open and close. The Zipper Waterproof Resealable are very good, waterproof sealing treatment. Fit for ID holder, name tag holder, badge holder, VIP, Events, Tradeshows,Etc. Usage: Business Exhibition Trade Shows Conference Reunions Meeting Press credentials Senior centers Workshop Shop Work Office Library Hotel Cruise Ship Travel Luggage Tags, Clothes hang label, reader identification Name Tags Credit Card Membership Card Stuff Key Card Fuel cards Bus subway Passes Theme Park Ticket SD Flash Drive Cards Art ring Any small and delicate items etc. 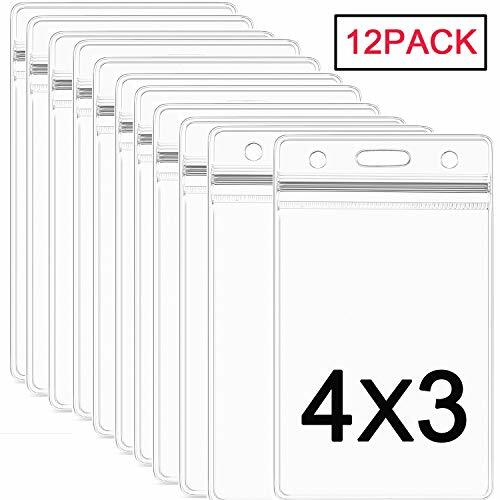  LARGE SIZE - Clear plastic ID pouch/sleeve Inner Dimensions: 3.2 " W x 4.48 " L . fits 3x4 inch nametag inserts for office, school, or social events.  DURABLE PVC - (poly vinyl chloride) material, wear-resistant and corrosion-resistant properties.High transparency. Even if multiple badge holders overlapping, read effortlessly.  DUAL-USE HANGING SLOT/HOLES DESING - the middle slot for lanyard, keychain or retractable carabiner reel clip, the both side holes for the cord/strap/string/thread. Strong and Flexible plastic material. The badge holders will not leave trace, folded and refolded many time. The hanging Slot/holes will not break, distorted many time.  WIDER EDGE, NOT CRACKING - Hot pressing forming production line at a time. Fully automated operation, close bonding pressure to improve the bonding more firm. Long-term use will not be aging. Low temperature resistance. After testing at -30 Degrees Celsius, it will not embrittle, to avoid cracking. WATERPROOF, FLEXIBLE AND RESEALABLE LOCK - Keep your credit cards and employee badges SECURE and DRY. Unlike other ID holders, our zip lock makes sure to keep everything dry and keep you worry free. Create name badges instantly with your inkjet or laser printer. Plain inserts for clip, pin, magnetic and hanging style name badge holders. Insert pages are 8 1/2" x 11" micro-perforated sheets that also come with printer instructions that help to customize name badges. Works with built-in templates in Microsoft Word and Corel WordPerfect, which can make it easy to make professional looking name badges for any event. Create name badges instantly with your inkjet or laser printer. Plain inserts for clip, pin and hanging style name badge holders. Comes on 8 1/2 x 11 sheets. Enjoy a CLEAR display, THICK quality, which holds any credit card-sized ID or our BONUS BADGE INSERT CARDS. Durable and handy lanyards with molded plastic head Ideal for people to carry their small electronic devices conveniently. Keep your devices safe and handy on the move. 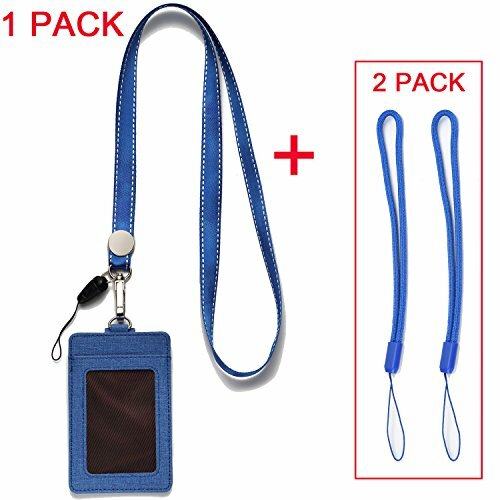 With these lanyards, ID Badge Holder, Name tag,most cell phones, USB flash drive, PDAs, music players, portable games, keychain and devices could be applied. Get it and keep your devices safe and handy on the move. 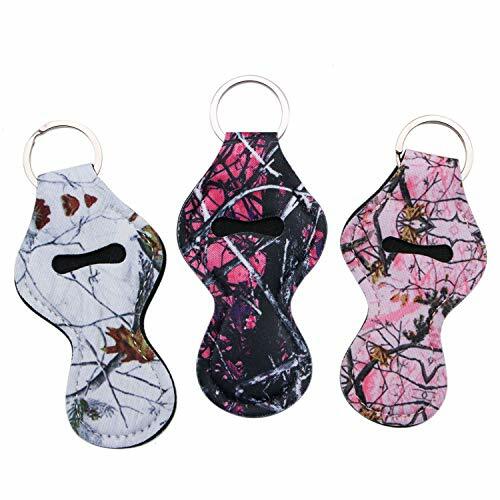  SAFE AND CONVENIENT---Holder is Made of Premium Durable PU leather & Polyester;Front ID Window with Clear Cover features visibility and protection.  BADGE HOLDER Back with 2 Card Slot Non-full card sized Back Card Slot for easy management and access. 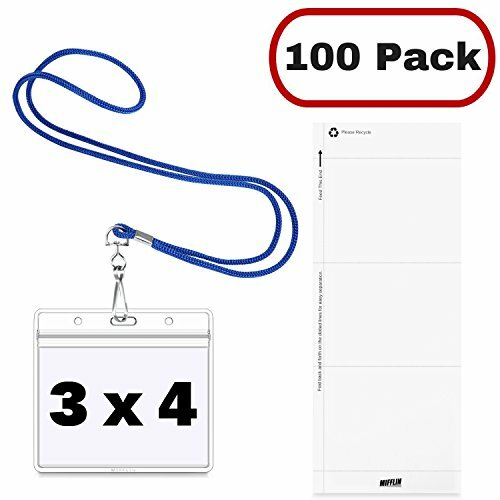  PACKAGE Include:1 x Lanyard 21.7 inches(One-Way);1 x Vertical Badge Holder (Badge Holder is 2.83 x 4.33 inches, fits 2.3 x 3.5 nametag insert. );2 Pack Button Nylon Lanyards.  EASY to UNPACK, EASY to ASSEMBLE: Packed neatly, no more tangled lanyards. THANK YOU for choosing the YOUOWO Products. If you need any assistance, or are not happy with our products by any chance, please do not hesitate to contact us. This horizontal ID holder is made of flexible, clear, tear resistant vinyl. And it's waterproof! The re-sealable pouch keeps your name tags, credit card, badge, or hotel keys safe and dry. Comes with three pre-punched holes for attaching many styles of strings, chains, clips or lanyards. Inside of Horizontal holder is 2.4" (height) x 3.75" (length), fits standard sized Name Badge Inserts 2.25" x 3.5". Easily fits 3 credit-cards, hotel keys, driver's license. Enjoy a CLEAR display, Good quality,which holds any credit card-sized ID or our BONUS BADGE INSERT CARDS. Make everlasting memories at your next conference, party, or office employee gathering. Let your guests mingle and network, without forgetting each other's names. Double side desing --- Front ID Window with Clear Cover features visibility and protection.Back with 2 Card Slot. Non-full card sized Back Card Slot for easy management and access. 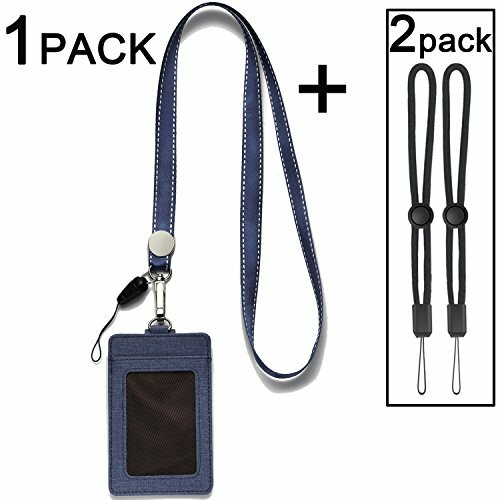 Lanyard With detachable buckle,Lightweight and easy to breakaway and connect the buckle. Metal hook and plastic buckle,Made of soft durable,polyeste,Good-quality;Convenient to carry your keys or ID. Lightweight, comfortable and soft to wear Easy to attach and detach for stuff with lanyard port/hole 21.7" long, designed to fit most people. 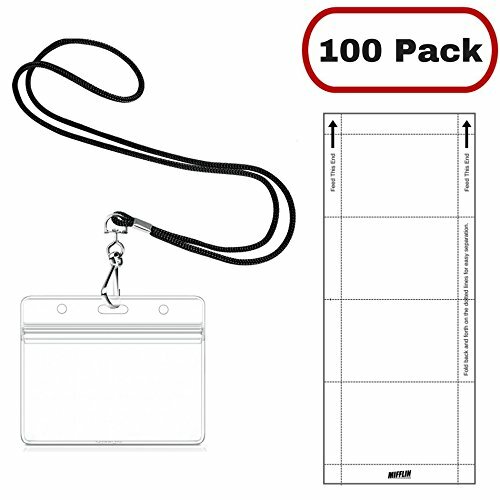 Easy to attach and detach for item Fit for ID holder, name tag holder, badge holder, VIP, Events, Tradeshows,Etc.  DOUBLE SIDED DESING --- Front ID Window with Clear Cover features visibility and protection.Back with 2 Card Slot.Non-full card sized Back Card Slot for easy management and access.  SAFE AND CONVENIENT---Holder is Made of Premium Durable PU leather & Polyester;Packed neatly, no more tangled lanyards.  HIGH QUALITY LANYARD--Lightweight, comfortable and soft to wear,Easy to attach and detach for stuff with lanyard hole.badge holder and lanyard necklace sets; for office, school, or social events.  Thank you for choosing AMUU products. If you are not satisfied, send us back the products and we will replace or refund it. 1. Please allow1-3mm error due to manual measurement. Thanks for your understanding. Reusable Reusable button badges, you can change out insert if you need. Superior Quality Buttons are made of great material, sturdy and non-fragile, with smooth surface, no scratches easy to assemble. Removable Metal Pin The metal pin on the back, so the buttons badges can be pinned onto clothing or a bag, and the pin can be removed if you do not need it. DIY Badges You can DIY badges with different patterns. 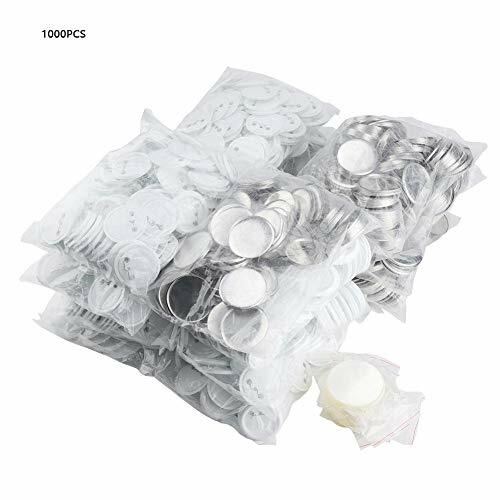 Suitable for normal family use, or set up your own booth at flea markets or fairs, quickly make and sell photo buttons. With a digital camera and a variety of button parts you can take photos and sell them as finished products. 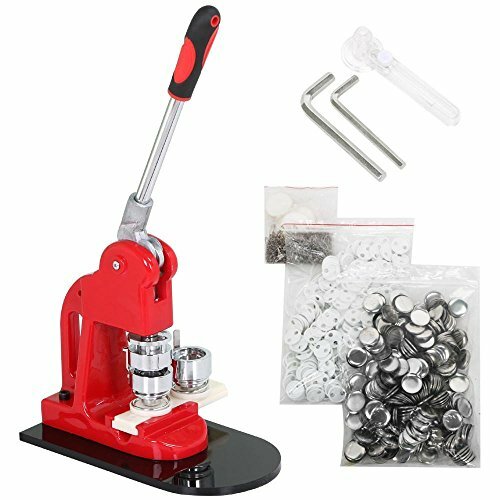 Wide Use The pin buttons are widely used for button DIY making for Christmas gifts, Tourist souvenirs, Personalized birthday gifts, etc. 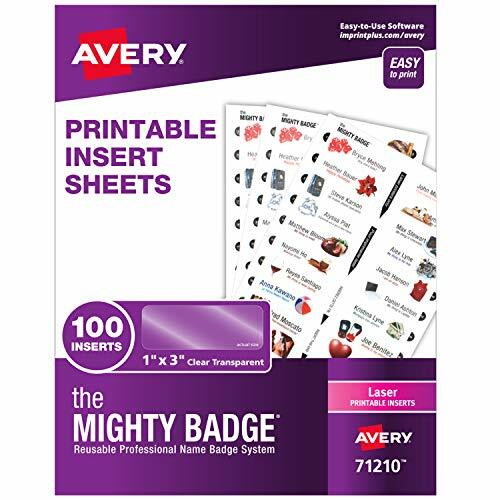 Create additional 1 x 3 name tags for the Mighty Badge by Avery Name Badge Kit with these printable insert sheets. This refill set includes 5 sheets of crystal clear inserts with 20 inserts per sheet that are compatible with laser printers. 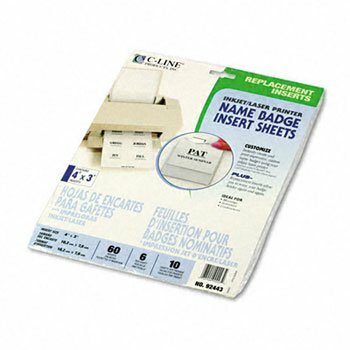 The non-adhesive, peel-off insert sheet is specially designed for multiple uses and reusability. Print off as many tags as you need and save the rest of the sheet to print later. Personalize professional, magnetic name tags with these inserts and Mighty Badge name badge holders. Please Note: The printable inserts in this pack are optimized for laser printers and the inkjet-compatible version of this product (71209) is recommended for use with inkjet printers. 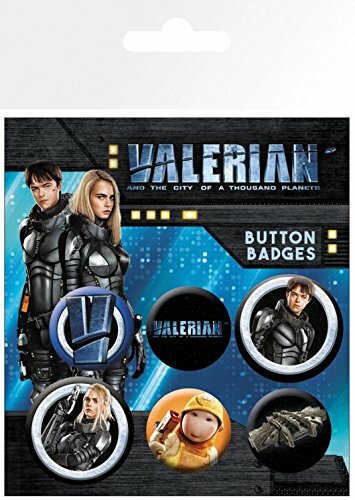 The Mighty Badge design software is not included.